Rabbit Housing Plans, Supplies and Information available. Free information is provided on housing rabbits along with rabbit housing advice and resources. So now that you have decided to make the big leap and start raising rabbits, you may be wondering what you need to do to properly house your future bunny rabbits. Although rabbits are fairly easy to take care of compared to most other animals, they do still require quality rabbit equipment and housing. In this article I will be providing you with rabbit housing advice and answering some of the common rabbit housing questions asked by newbies. 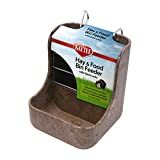 Also I will be providing you with rabbit housing supplies for sale links which you can use to go ahead and purchase your required rabbit supplies. If you are new to the rabbit industry I suggest that you subscribe to our Free Rabbit Breeders Newsletter, so I can send you periodic information and resources about raising and breeding rabbits. 1. Purchase quality rather than quantity: I know you have probably heard this saying a hundred times, however it is relevant to purchasing rabbit housing supplies too. If you start out right, your chances of success with increase dramatically. Don’t cut corners when buying your rabbit supplies or you might just regret it in the long run. 2. Buy extra rabbit cages if possible: Under the right circumstances rabbits can well… “multiply like rabbits”. It is important if you plan on breeding your rabbits, that you have adequate rabbit cage space available. Don’t make the mistake of not planning in advance. 3. House your rabbits in a safe environment: One of the most important things that you can do for your rabbits, is to house them in a safe environment. Keep your rabbits away from potential predators such as dogs, cats, racoons, possums, hawks, coyotes and snakes. 4. Keep your rabbits out of the weather: I know this might seem like common sense however many rabbit raisers surprisingly fail to keep their beloved rabbits out of the weather. It is definitely not good for your rabbits to be left out somewhere that they can get rained on. Also if you live in a warmer climate, be ample sure that you keep your rabbits out of the direct sunlight if at all possible. 5. Do your research: As with any project, rabbits require dedication from your part. Be sure that you adequately prepare for your rabbits by doing your research ahead of time. Go grab a book or two from our rabbit books for sale page before getting started. Also be sure to subscribe to our free newsletter. Q1: Do rabbits need to live in cages or hutches? A1: Most rabbit breeders including myself agree that rabbits should have their own cages or hutches to live in. We recommend this with regard to your rabbits security and comfort. However, this doesn’t mean that you can’t take them out of their cages under supervision and let them have some bunny fun! Q2: Do I need to purchase a rabbit carrier for my rabbits? A2: Although there are indeed other ways to transport your rabbits, it is ideal that you do purchase a carrier for your rabbits for your own convenience and your rabbits’ safety. Q3: Do rabbits need their own cages to live in? A3: Ideally all of your full grown rabbits should have their own cages to live in. When one of your does has bunnies they can share a cage or hutch until the bunnies quit nursing or you decide to ween them. Q4: Where can I purchase rabbit housing supplies? A4: If you wish to get started and purchase your rabbit housing supplies, visit our rabbit supplies page and start shopping! Rabbit Cages for Sale: Use our rabbit cages for sale page to find terrific deals on rabbit cages and information on cage selection. 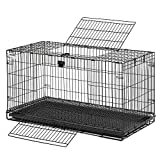 Our cages catalog includes quality rabbit cages from multiple rabbit suppliers and vendors. You can find both indoor and outdoor rabbit cages for sale. The cages come in a variety of different sizes, in fact they range from huge rabbit cages to small rabbit cages and include everything in-between. These rabbit cages will serve as multipurpose and flat out terrific rabbit housing material. Rabbit Carriers for Sale: It is recommended that rabbit raisers purchase rabbit carriers to use for transportation. You can find lots of quality and recommended rabbit carriers for sale from our supplies page. The carriers come in all different sizes and shapes to best serve your specific rabbit needs. Whether you own huge flemish giant rabbits or tiny netherland dwarfs, these carriers will be for you. Rabbit Hutches for Sale: Find rabbit hutches for sale in all shapes, sizes and prices. Use our for sale page to price shop and find quality deals on rabbit hutches. Don’t make the mistake of failing to prepare for your rabbits… purchase a rabbit hutch today to solve your rabbit housing needs. Have comments or questions regarding this article about rabbit housing? Feel free to ask us on our Rabbit Breeders Facebook Page. Also be sure to click the “like” button below if you found this article useful.